Researchers address complex societal problems through cross-disciplinary scientific pursuit—which necessitates long-term and sustainable collaborations. However, such team science efforts are not easily supported by the same funding approaches and mechanisms as individual investigator-driven research. The panel will begin with a presentation of key differences between developing and funding team science vs. individual research and discuss collaborative research funding opportunities available different agencies. Representative opportunities will then be presented in more detail. A presentation on the National Science Foundation’s Science and Technology Centers: Integrative Partnerships (STC) Program will emphasize the requirements for a successful large research center, in particular, on issues related to leading large multidisciplinary and multi-institutional teams. A presentation on the NIH National Cancer Institute’s Physical Sciences-Oncology (PS-OC) Program will demonstrate the convergence of physical and biomedical sciences through formation of a network of multidisciplinary scientific teams and highlight unique program elements fostering collaborative team science. Moving to a foundation and small team science perspective, a presentation about Scialog, a program of the Research Corporation for Science Advancement, will describe acceleration of transformative science by cultivating a strong network of scientists through annual conferences with authentic dialog and competitive proposal writing. Rigorous scientific program assessment of the effectiveness of collaborative funding mechanisms is an integral component of all these programs. Panelists will discuss their agencies’ approaches to assessing and evaluating the effectiveness and outcomes of team science support. Dragana Brzakovic, Ph.D., started in the Office of Integrative Activities in 2000 by running the Science and Technology Centers (STC): Integrative Partnerships competition. She also coordinated Major Research Instrumentation program for the National Science Foundation in period 2003- 2006. During 2007 Dr. Brzakovic was a Brookings Legislative Fellow on the Capital Hill. Dr. Brzakovic’s current responsibilities include oversight of 6 centers in the STC program, coordination of various activities in this program, and coordination of the NSF Centers Forum. She is also involved in various other cross-disciplinary activities. Prior to NSF Dr. Brzakovic held positions of Professor of Electrical Engineering and Computer Science at Lehigh University (1992-2000) and Associate Professor of Electrical Engineering at the University of Tennessee-Knoxville (1989-1992). During her academic career her primary research interests were in the area of computer vision and image understanding. Dr. Brzakovic received her Ph.D. and ME degrees from University of Florida, and her B.S. degree from University of Belgrade, all in Electrical Engineering. Holly Falk-Krzesinski, Ph.D., is the Director Research Team Support (RTS) within NUCATS Institute, Dr. Falk-Krzesinski works with the RTS team and the rest of NUCATS to catalyze new clinical and translational multi- and interdisciplinary research initiatives; conduct, support, and disseminate research on the science of team science; and develop resources and tools to promote collaboration. 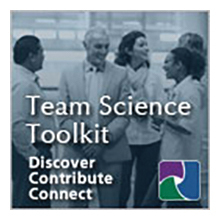 She also serves as a conduit to translate empirical findings from team science research into evidence-based guidance to teams engaged in multi- and interdisciplinary clinical and translational research. Dr. Falk-Krzesinski has experience catalyzing and fostering a number of major cross-disciplinary, team-oriented translational research initiatives spanning structural genomics of infectious diseases to cancer nanotechnology to oncofertility to regenerative medicine. Dr. Falk-Krzesinski is a Research Assistant Professor in the NUCATS Institute at the Feinberg School of Medicine and a Senior Lecturer in the Department of Biochemistry, Molecular Biology, & Cell Biology in the Weinberg College of Arts & Sciences. She teaches Grantsmanship courses through Northwestern’s School of Continuing Studies and conducts grantsmanship, finding funding opportunities, and CV/resume/cover letter courses and workshops as a consultant. Dr. Falk-Krzesinski is also Co-director, along with Professor Katherine Faber, of the Howard Hughes Medical Institute and Burroughs Wellcome Fund-sponsored Navigating the Professoriate Program, a professional development program for early career women faculty in STEM disciplines. Jerry Lee, Ph.D., serves as the Deputy Director for the NCI’s Center for Strategic Scientific Initiatives (CSSI). He provides scientific input and expertise to the planning, coordination, development, and deployment of the innovation center’s strategic scientific initiatives. Dr. Lee serves and leads various trans-NCI working groups and also represents CSSI at various NIH, HHS, and external committees and other activities to develop effective partnerships across Federal agencies, and to build collaborations with key external stakeholders. Dr. Lee is responsible for providing day-to-day administrative and programmatic management for CSSI’s offices. He serves as Acting Director for the Office of Physical Sciences-Oncology, responsible for initiatives at the interface of physical and life sciences including the NCI’s Physical Sciences-Oncology Centers (PS-OCs) program, and also as Acting Director for the TCGA Program Office. Dr. Lee’s efforts facilitate the execution of cross-disciplinary strategies and synergies in key areas of research and training to support these emerging fields. His past experience at NIH includes serving as a program manager for the NCI’s Innovative Molecular Analysis Technologies (IMAT) program and the NCI Alliance for Nanotechnology in Cancer program, where he was Program Director of fellowships to support multidisciplinary training in cancer nanotechnology. Scientifically, Dr. Lee has extensive research experience in using engineering-based approaches to examine mechanisms of age-related diseases and cancer progression focused on combining cell biology, molecular biology, and engineering to understand various cellular reactions to external stimuli. Specifically, Dr. Lee’s research has emphasized increasing the understanding of RhoGTPase-mediated nuclear and cellular mechanical responses to fluid flow, 3D culture, and contributions to laminopathies such as progeria. He has coauthored numerous papers, two book chapters, one book, and has spoken at various cell biological and biomedical conferences. Larry Nagahara, Ph.D., is Director of Physical Sciences in Oncology in the Office of the Director at the National Cancer Institute (NCI); where he coordinates program and research activities related to expanding the role of the physical sciences in cancer research. This activity includes the Physical Sciences in Oncology Centers (PS-OCs), a newly launched 5 years initiative to incorporate physical sciences approaches to understand the physical laws and principles that shape and govern the emergence and behavior of cancer at all scales. Previously, he served as the Nanotechnology Projects Manager for the NCI’s Alliance for Nanotechnology in Cancer program, where he helped oversee the development of promising nano-based diagnostics and therapeutics projects and turned them into applications that will eventually benefit cancer patients Dr. Nagahara also currently represents NCI on the Trans-NIH Nano Task Force, which is tasked to develop NIH-wide scientific and policy vision for nanotechnology, as well as NCI’s Project Scientist for the NIH’s Nanomedicine Development Centers and NIH’s Genes and Environment Initiative (GEI), Exposure Biology Program. Dr. Nagahara has been actively involved in physical sciences and nanotechnology for over 15 years, most notably novel scanning probe microscopy development, carbon nanotube applications, molecular electronics, nanoenergy, and nanosensors. Prior to joining NCI, he was a Distinguished Member of the Technical Staff at Motorola and led their nanosensor effort. He is also currently an adjunct professor in the Department of Physics at Arizona State University, and an Associate Editor of the IEEE Sensors Journal. Dr. Nagahara has published over 80 technical papers, 3 book chapters, and 1 book pending as well as over 15 patents issued/filed in these fields. He is an American Physical Society (APS) Fellow, a Nano50 Awardee, and was a member of Motorola’s Scientific Advisory Board. Richard Wiener, Ph.D., is a Program Officer at Research Corporation for Science Advancement, a private foundation founded in 1912 and America’s first foundation dedicated solely to the advancement of science. Wiener’s research interests include experimentally investigating the dynamics of nonlinear patternforming systems, controlling chaotic fluid flows, applying dynamical systems theory to model opinion dynamics on social networks, and using social network analysis to assess the effectiveness of grants programs for funding highly innovative interdisciplinary team research in the physical sciences. He completed a BA in philosophy at the University of California, Berkeley in 1978 and a PhD in physics at the University of Oregon under the direction of London prize recipient Russell Donnelly in 1991. He also worked as a teaching assistant at the University of Oregon with David Sokoloff, a leading physics education researcher. From 1995-2006 Wiener was a physics professor at Pacific University Oregon and Chair of the Division of Natural Sciences from 2004-2006. He has been a National Corporation for Atmospheric Research Postdoctoral Fellow in Ocean Modeling at Oregon State University, a Visiting Professor at Lewis & Clark College, and a Visiting Scientist and Visiting Professor in Eberhard Bodenschatz’ research group at Cornell University. Wiener currently holds an appointment as an adjunct professor of physics at the University of Arizona and he is a member of the Executive Committee of the Forum on Physics and Society of the American Physical Society.